All chargers are $49.99 and come with full 1 year warranty. If you have Macbook Air you need 45W charger. The 45W chargers will not work with any other model but the Macbook Air. The Macbook Air have two type of power adapters. 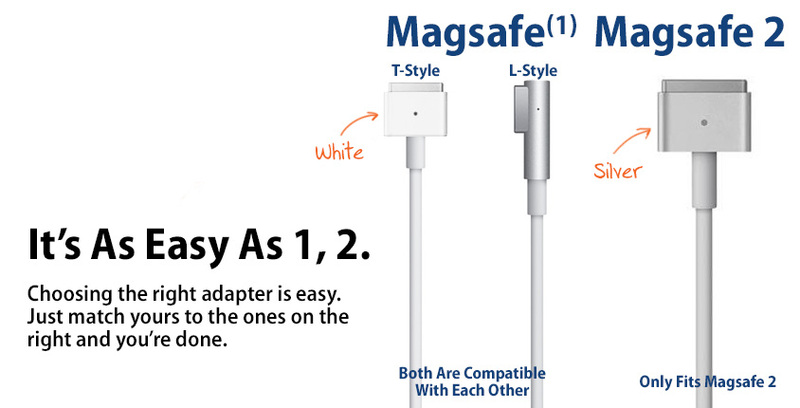 One is MagSafe 1, the other is MagSafe 2. You can see the difference from the picture above. For all other Macbook chargers, the general rule is if your laptop have Retina display and is 2013 or newer you need MagSage 2 power adapter. If your laptop is Mid 2012 or prior year you will need MagSage 1 charger. Please send us a message from our Contact Us form if you have a question or need further assistance with identifying the correct charger for your laptop.